1. 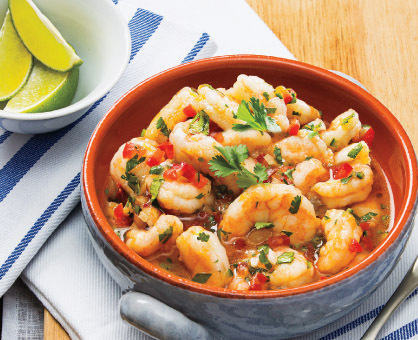 In medium bowl, toss shrimp and 1/2 cup each lemon and lime juice until well combined. 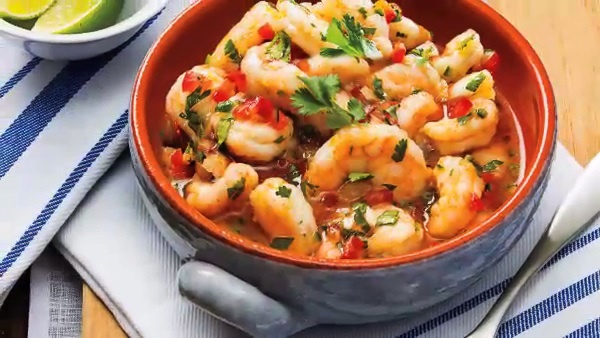 Cover and refrigerate at least 4 hours or up to overnight, stirring twice to coat shrimp. 2. In small bowl, whisk together oil, sugar, paprika, salt and remaining 2 tablespoons each lemon and lime juice. 3. Pour off liquid from shrimp mixture. Add tomatoes, cilantro, onion, serrano and oil-juice mixture; toss to combine. Serve immediately with tortilla chips garnished with lime wedges, if desired. Makes about 3-1/2 cups. Also spelled seviche, this dish is a popular Latin American appetizer of raw fish and/or seafood marinated in citrus juices. The acidity of the juice “cooks” the fish, giving it a firm texture and opaque appearance.